On this page I’ll provide a tutorial on how to set up and configure rFactor 1 along with the DirtWorks Designs Stocks 2015 mod and 2015 Track Pack. 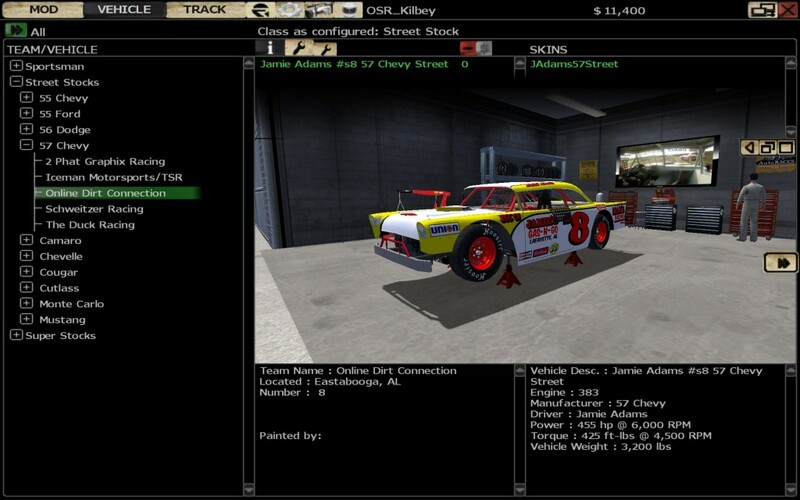 I chose this mod because it provides three different cars — Street Stocks, Super Stocks, and Sportsmen. DirtWorks Designs produces some of the best mods I’ve ever seen for rFactor. The AI work very well, and the mod is excellent in every respect. Best of all, this is a fun mod. Whether you’re racing online against real world competitors, or either offline or online against the AI, you will experience the thrill and full immersion of side by side racing. So let’s get started. Note: All instructions pertain to a Windows 7 or Windows 10 install. Other versions of Windows may be different, but all should be similar. If you have any questions, Join OSR Voice/Text Chat here. If you don’t already have rFactor, you will, of course, need to download and install it. You can download the full installer (1 GB) or the lite installer (274 MB). If your intention is to run modifications (mods), then I suggest the lite installer. The full installer is going to install additional demo cars and tracks that come packaged with rFactor. My suggestion: download the lite installer. Once you get that downloaded, just double click and install it. I recommend installing it to the default location (C:/Program Files(x86)/rFactor), which means just keep clicking next, accept, yes, etc. as you go through the installation process. It will make it easier when you get ready to install your mods. Important: The installer will place a shortcut to rFactor on your desktop. Right click on the shortcut, then select Properties. In the Properties window, select the Compatibility tab, as shown in the image to the left. 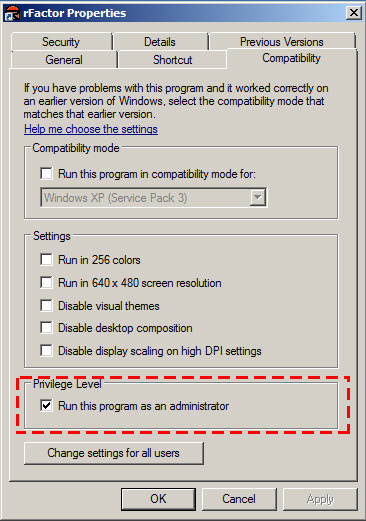 Place a check mark in the box next to “Run this program as an administrator,” as shown in the image. Click Apply, then click OK. It’s important that you always run rFactor as an administrotor. Advanced Users: If you have UAC (User Access Control) disabled in your Windows settings, you can disregard this part. Now we can move on to the next part of the installation process. First, you need to open rFactor and make sure it runs on your system without any problems. You might want to take this opportunity to have a brief look around in the UI. If you like what you see so far and want to continue to install your favorite mods, you will need to activate your copy of rFactor. You can do that on the rFactor website at rfactor.net/web/rf1/buyonline2/. As I’m writing this, the rFactor download links are working, but the rFactor website is down. Contact me if you need more help with rFactor. After you get rFactor activated, you can then install the mods for the cars and tracks that you like. Read on to see how to do that. Inside your rFactor installation folder (C:/Program Files(x86)/rFactor) there are a couple of other things that you might want to look at. One is rFactor Dedicated. This is the rFactor dedicated server program that you would use if you wanted to run an rFactor server. The other is rF Config. This is for configuring your rFactor graphics settings. 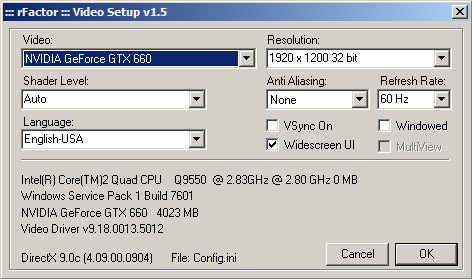 The first time you run rFactor, rF Config will most likely run first so you can change your graphics settings. You can always open your rFactor installation folder and run rF Config again to change any graphics settings for rFactor. Note: I strongly suggest you run rF Config as an administrator. You can set configure that the same way we configured your rFactor Desktop shortcut above. The image to the left shows my current rFactor graphics settings. You can experiment with these settings to see what works best on your system. Another thing you’ll notice is the loud and lengthy introductions when you first run rFactor. You can disable these by finding the folder C:/Program Files(x86)/rFactor/MovieFiles. Simply rename the folder and they won’t run any more. You’ll go straight to your UI screen. That concludes the rFactor installation. Next, we’ll download and install the DirtWorks Designs Stocks 2015 mod, then configure rFactor controls. You don’t have to use this mod. I use it as an example here because DirtWorks Designs makes very good mods, and these cars are fun. This step is relatively straightforward. The first thing we need to do is head over to DirtWorks Designs and download the Stocks 2015 mod. As of this writing, that is the latest DirtWorks Design Stock Car mod. Support for this mod as well as additional DirtWorks Design Mods, tracks, templates for painting, etc., is provided through the DirtWorks Designs website. Next, download the DirtWorks Designs 2015 Track Pack and you might as well get the track fixes as well. Again, this is a suggested track pack, and the latest DirtWorks Designs track pack available as of this writing. You can use different track packs if you like. It probably doesn’t make too much difference what order you follow as long as you install the track fixes after you install the track pack. That concludes the installation of the DirtWorks Designs Stocks 2015 and Track Pack. Now you’re ready to run rFactor and configure your controller and a few other options. If you’ve done everything correctly, you can now run rFactor. When you open the simulator, you’ll note that it loads a DirtWorks Designs user interface (UI). Some modders make their own UI. Some use the default rFactor UI with little or no modification. This is something to keep in mind as you move from one mod to another in rFactor. If you choose to install the Dirt Late Model 2 mod, you’ll see that the default rFactor UI is used with a DLM2 logo added. If you try the Winged Sprint Cars from Sprintcars Online, you’ll see their custom UI. Even though these interfaces look different, they all work pretty much the same. Since we installed the DirtWorks Designs Stocks 2015 mod, we’ll use their UI to configure rFactor. The first screen you see when you open rFactor is shown in the image below. This is the vehicle selection screen. You can select the type of car in the sidebar on the left. As you can see, you can choose from Sportsman, Street Stocks, or Super Stocks. Starting at the top left, I’ll describe the various buttons. MOD – This button takes you to the mod selection screen where you can select from the different mods that you have installed. If you change mods, and the new mod you’ve selected has a custom user interface, you’ll have to restart rFactor to see the new interface, or you can continue, using the interface from the previous mod. VEHICLE – That’s the current vehicle selection screen. TRACK – This button takes you to the track selection screen where you can select from all the tracks you have loaded. rFactor Logo Button – This takes you to a screen with many options for setting up a race session, etc., including session type, car types allowed, AI options, track, and several other options. You’ll want to take a close look at this screen and experiment with the options and learn them. Gear Icon – This takes you to the settings page with rules, difficulty settings, display and audio settings, and controls, where you set up your controller or steering wheel. Video Camera Icon – This is the “replay fridge.” By default, rFactor will save a replay from every session you run. It’s a good idea to delete the older ones occasionally. Helmet Icon – This is where you set up your driver profile. You’ll want to go here first. Your controller settings and race setups will be saved under your profile. You can find your profile outside the sim at C:/Program Files(x86)/rFactor/UserData. If you want to change your name, you’ll have to create a new profile. Another option would be to navigate to the location above and change the name of the profile folder to the name you want. I haven’t tried this, but it should work with no problem. Since all your setups and other settings are in your profile folder, it is a better option to change the name of the Windows folder in order to change your name in rFactor. Other buttons – The button in the top right that looks like two computer screens is the multiplayer button. Clicking it will take you to the list of multiplayer servers available. The two wrench buttons near the top center take you to the car configuration page where you can upgrade your car with some options. Next you should calibrate and configure your Logitech G27 or similar wheel to use in rFactor. That concludes this rFactor installation and configuration tutorial. I hope it helps. If you have any questions you can find me on the OSR Voice/Text Chat Discord Server or you can contact me here. Hoping you can help me. For some reason DWD UI is not running when I launch Rfactor. Everything for DWD is set as administrator however, I keep seeing the RFactor UI. Is there another way to set DWD As the primary UI? The only way I can recall is to select a DWD mod from the default UI, then close rFactor and reopen it, and it should load the DWD UI. If that doesn’t work I’m not sure what you need to do, but you could try emailing DWD or posting in their forum.